What’s Up, Basketball world it Jaquan Harris and I’m back for another week of Diary Of A Baller. Here’s how my week went. Monday: Back to the same routine up early for school. Monday was the day after my tournament so I was pretty tired and sore but I couldn’t let it affect me in school. I had to fight through it and still get done what I had to do. After school I had boxing at about 7:00 PM to 8:00 PM. 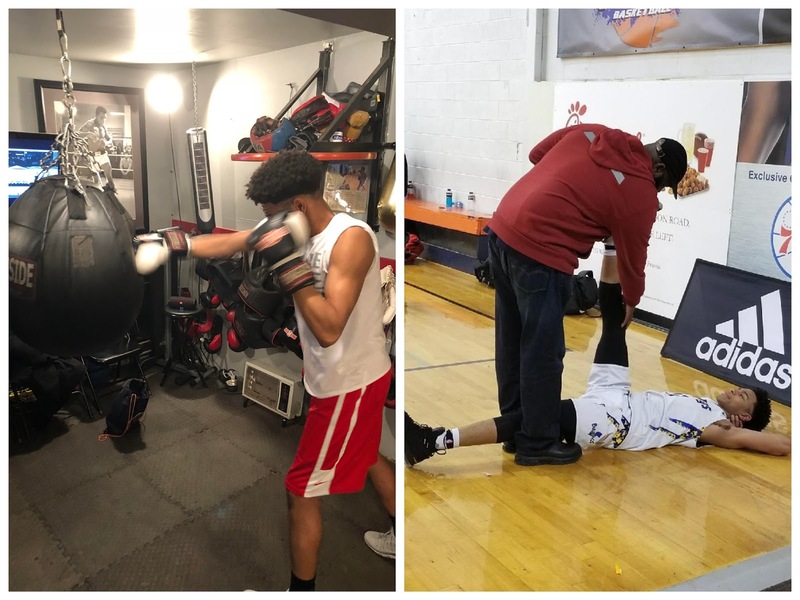 I do boxing to help my cardio and so I can get more aggressive on the court. I enjoy it a lot it’s a good change to do something other the basketball. Tuesday: I went back to training with my basketball trainer again for the 2-3 hours like I usually do after school. Since I had another tournament this weekend we shot up a lot of shots. During the workout just making sure everything was going to be good during the weekend and we were going to be doing that the whole week. Wednesday: Today I had practice also with tryouts for my team we just wanted to see if we were able to get any new players before the spring comes. The tryouts went well there was a good amount of people there. But the main focus was the practice it was the only practice we were going to have before the weekend, we had to take it seriously so we will all be ready for the weekend. Thursday: The school day felt quick today it usually feels long just like every other day. After school I went straight to training again but I couldn’t do as many hours as I wanted because I had a lot of homework, and my dad always teaches me school first. I had to study for two tests that week so I had to get it done. Friday: The day before the tournament I found out late that it was the Adidas Select Series so it was a big tournament and we were playing good teams. So, I had to be ready for whatever comes at us. Once school went by I usually rest the day before games but I still wanted to get shots up because I felt like I was going to be a little rusty. I didn’t go for long but I just wanted to make sure I was ready. Saturday: I ate a good breakfast and got a haircut before my games like I usually do before every tournament. Since my game were late I could chill for a little. They were in Pennsylvania it wasn’t that far from me it was about 1 hour and 30 minutes. My games were the latest games the first was 6:40 and the second was 8:55. The first game we played Squad Elite, we started off real slow in the beginning we knew they couldn’t hang with us but we were jut letting the stick around. One the second half started we went on a big run and began to blow them out the water. We took the dub and just waited until the next game. Next game we played Team Loaded DC this was going to be a big game for us. Everyone knows we are the best teams in the tournament. The game started early because one of the teams playing before us forfeited and took their team of the court so they made us play right away. I didn’t have much time to stretch and warm up so I just had to deal with it. This was probably one of our worst scoring games all year nothing was falling for us, I played ok but I could had played better I ended with 15 points but we lost and I care about if we win or lose not my personal performance. Sunday: We had two early games so we had to get going early and do what we had to do to these teams. The first game was easy we won by 40. A new player came to our team so it was a good day to see what he can do and how he can help us. The second game was a little harder it was one of those games again when nothing was falling but this time we came out with the win. The difference from Saturday and today was we stayed together when nothing was falling and took it upon ourselves to make sure we came out with the dub we won by 1 point.